Being an inbound marketer you very well know how important a landing page happens to be to generate leads rather qualified leads. However, a landing page is itself comprised of various other factors that impact your lead generation and even conversions sometimes. The landing page form or the lead-capture form is one very crucial of them. The lead-capture form is a form on the landing page that’s meant to capture the information of the visitor in exchange for an offer. So, it is understood that why is it so crucial and why it should be optimized well according to you and your customer’s needs. But then how would we go about it as it is really hard to pin down a lead-capture form. Its length or properties entirely depend on your requirement and the customer type. A too lengthy landing page form can acts as an impediment to customers filling out the form and redeeming the offer however if it is too short you might miss out to some very crucial information that your sales team had required to qualify the lead and convert them into sales. So, what should be an ideal length for a landing page form so that your visitors fill out the form also and you get all desired information as well? Let’s dive into how to settle on whether what length will be perfect for your distinguished landing pages forms. What do you want from the landing page form? See! If you need more leads even a shorter form would do that for you as more people will be willing to fill it out however the visitors who are ready to fill out even the longer forms to redeem the offer are more likely to convert at the end and are usually high quality leads. Basically, it is the quality of the leads that varies. So, in one of the case you have quality while in the other you have the quantity. Moreover, it is the work of your sales team to convert leads to sales whatever kind it is. So you must take suggestions from them as to what should or not be included in your landing page form for a better & smoother movement of the customer down the sales funnel. You sales team might be undergoing an overall deficiency in leads and that in such situation you need more leads than just a few qualified leads. So, in order to capture more leads you need to keep your lead-capture form short and simple eliminating as much friction as possible. You mainly require asking for information that is enough for sales team to contact your leads such as visitor’s name, email address, phone number etc. More information will of course make it easier for sales team to qualify the leads but then remember you can always ask for more information during the sales process goes on. So, you need to concentrate on what’s crucial for your business- more leads or a few high quality leads. You sales team has quite a considerable number of leads but then by the time they figure out as to which leads are going to be converted and which are not , they already have wasted much of their time nurturing the leads which are never going to be converted. They could have utilized this time to nurture the qualified leads bringing more sales for your business. Hence, if your main concern is the quality of leads and not the quantity, then you should always employ the longer forms to filter out leads that will never convert. However, that does not mean you can ask anything and everything, the form’s relevancy and length are something that still need to be paid attention to. If comprised of relevant fields, the longer forms are for sure going to do the trick. Those, who aren’t actually interested in your business, will seldom fill up a lengthier form however those who are interested are most likely to fill the desired information to redeem the offer. Now, what would be the fields that you can include in your forms? It entirely depends on your business, its requirements and your buyer’s persona. For instance, let’s say , you are a local electrician providing services to people in a specific geographic location, so you would certainly need to ask your leads to provide their location. 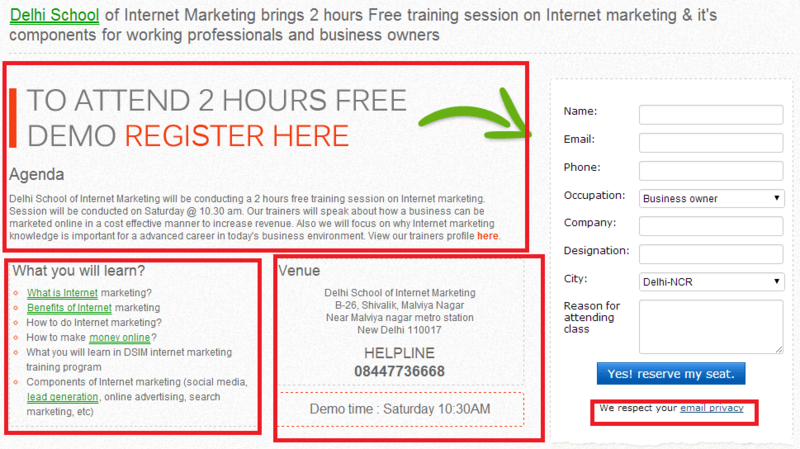 This is how you will be able to weed out any leads that are outside of the locations you provide services to. You can also add a question or two in your lead capture form as that would help you gauge the visitor’s need for your product and their chances to buy your product or service. 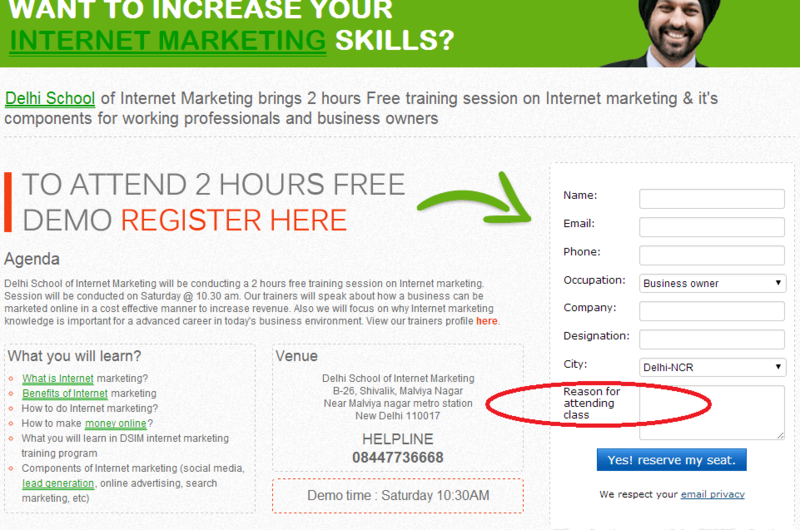 For example, DSIM’s landing page form includes an optional field that says ‘reason for attending classes’. This information helps to learn more about the leads and even in qualifying them before they go through the sales cycle. Besides, we already know how helpful the longer forms are for the sales team. They don’t have to waste time nurturing leads that aren’t typically a good fit for your products or services. The best way to determine the length of the lead capture form is to do some A/B testing and see that through which type of forms you are able to accomplish your goals, which fields are essential and so on. 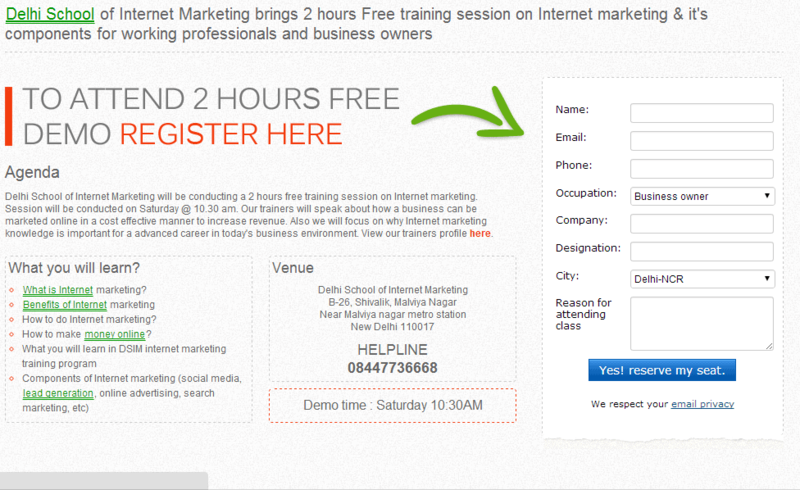 See which types of forms are giving you good number of leads or better conversions and act accordingly. However, sometimes other factors on landing page are accountable for the results too. So, you also need to keep that in mind that form’s length isn’t the only factor. Form’s length is only one of the factors that are accountable for landing page conversion rates. It is important for you to know this so that you don’t waste time optimizing your form’s length unnecessarily while it is something else that’s causing the bad results. For your help, here are a few factors that decide whether the landing page visitor will complete the form or not. How valuable the offer is that has to be redeemed by the visitors. The information that is being requested on the form. For example a too-sensitive question might thwart the visitor from filing up the form. The credibility of the website and the sense of privacy or security that the visitor has perceived. Hence, marketers need to understand this that with landing page form’s length there are various other factors that are responsible for conversions.